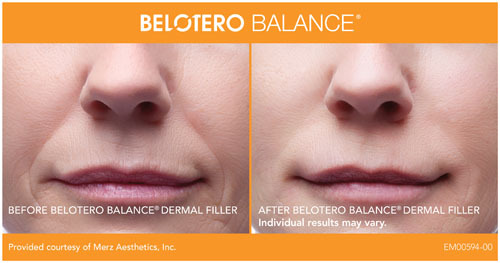 • BELOTERO BALANCE Dermal Filler has a unique manufacturing process that offers a soft, cohesive gel that is able to fill in your wrinkles for results that are even, smooth and immediate. 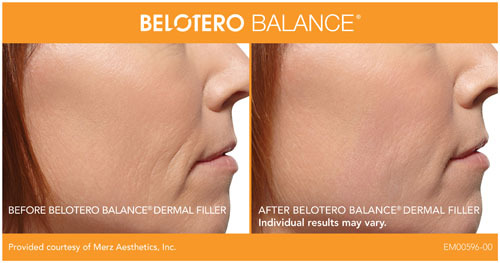 • Once injected, BELOTERO BALANCE Dermal Filler instantly plumps the skin and smoothes the lines or wrinkles on your face. Contraindications: BELOTERO BALANCE® should not be used in patients with severe allergies manifested by a history of anaphylaxis, with a history or presence of multiple severe allergies. BELOTERO BALANCE® contains a trace amount of gram-positive bacterial proteins, and is contraindicated in patients with a history of allergies to such material. BELOTERO BALANCE® must not be implanted into blood vessels. 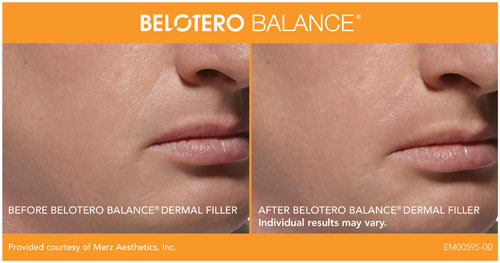 Precautions: The safety or effectiveness of BELOTERO BALANCE® for the treatment of dermal contour defects other than nasolabial folds, such as use in the lips, has not been established in controlled clinical studies. The safety of BELOTERO BALANCE® for use during pregnancy, in breastfeeding females, or in patients under 21 years has not been established. As with all transcutaneous procedures, BELOTERO BALANCE® injection carries a risk of infection. Patients who are using substances that reduce coagulation, such as aspirin, non-steroidal anti-inflammatory drugs, and warfarin may, as with any injection, experience increased bruising or bleeding at injection sites. Patients should inform their physicians if they are taking such substances. Laser treatment, chemical peeling, or any other procedure based on active dermal response performed after treatment with BELOTERO BALANCE® may increase the risk of an inflammatory reaction at the injection site. Similarly, the administration of BELOTERO BALANCE® before the skin has healed completely after such a procedure may also increase the risk of inflammatory reactions. Exposure of the treated area to excessive sun, UV lamp exposure, and extreme cold weather should be minimized until any initial swelling and redness have resolved and puncture sites have healed.